Lock in a great price for Holiday Inn Express New Orleans Downtown – rated 8 by recent guests! The location was great for walking into the French Quarter. The location was so close to everything and affordable. Breakfast was great. Shandra ? at the front desk was able to provide us with a larger room as we requested. It happened on our 3rd of a 5 night stay. The others at the desk made no effort to accommodate us. Shandra was the only one who made an effort to help us. Thank you Shandra. She deserves a raise!! Hotel front desk staff was nice. Location was great . It was a very nice hotel. I actually talked to one of the housekeeping houseman in the elevator he was very nice. The hotel itself was nice. Need better staff at the front desk. Location!! Within walking distance of French Quarter, football stadium, and casino. We even ventured to Tremé to try a restaurant we found online. Plus our room was very spacious and clean. The staff, food, location, hot chocolate, room,...all delightful. Holiday Inn Express New Orleans Downtown This rating is a reflection of how the property compares to the industry standard when it comes to price, facilities and services available. It's based on a self-evaluation by the property. Use this rating to help choose your stay! One of our top picks in New Orleans.Just 3 blocks from the French Quarter and 5 blocks from Bourbon Street, this New Orleans hotel features an outdoor pool and patio. Every room provides free Wi-Fi and a 32-inch cable TV. Holiday Inn Express New Orleans features a coffee maker and an alarm clock in every guest room. Rooms are also equipped with a work desk and chair as well as ironing facilities. Guests can use the gym or the laundry facilities at the Holiday Inn Express New Orleans. Free newspapers are available on weekdays. The Superdome arena and Harrah's Casino are within 6 blocks of the O'Keefe. The Morial Convention Center is 8 blocks away. When would you like to stay at Holiday Inn Express New Orleans Downtown? Please note, bed type preferences are subject to availability. 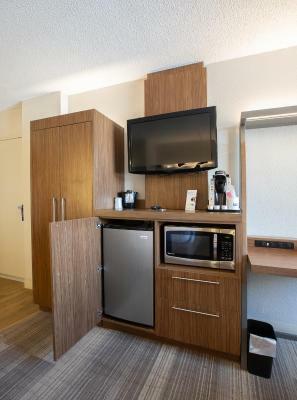 All rooms feature a mini-fridge, microwave and coffee maker. Public parking is available on site (reservation is not possible) and costs USD 29 per day. This room features a work desk, ironing facilities and cable TV. This accessible room features a work desk, ironing facilities and cable TV. House Rules Holiday Inn Express New Orleans Downtown takes special requests – add in the next step! Holiday Inn Express New Orleans Downtown accepts these cards and reserves the right to temporarily hold an amount prior to arrival. Great location. Walking distance to the French Quarter. Great breakfast. The barn style door on the bathroom. It made a lot of noice and didn't close all the way. The ice machine on my floor wasn’t working! The bake cookies were good! The incredibly rude staff. The cold breakfast. Breakfast was from 6-9:30am. Often times there was no food out even at 9 am. Food should be stocked and hot until 9:30am. The room we stayed in was dirty and outdated. The sink was cracked, the sheets has stains on them. Overall, the rude front desk employees ruined the overall experience. Breakfast time given at 6:30 am and when I go down at 6:45 am it is not ready because of the one person responsible for preparing the breakfast. There was not much choice and the breakfast was late for the first three mornings I was there so this made me delay my departure for my meetings. Window shade that did not darken the interior of the room rather street lights visible at night. One trash can. No bathroom hooks. No safety bar for shower. Sink drain stopper stuck in lowered position, hence water backed up with use. There was a piece of metal protruding from the foot of the bed that was potentially harmful as I walked into it. First front desk meeting upon check-in was extremely "chilly". 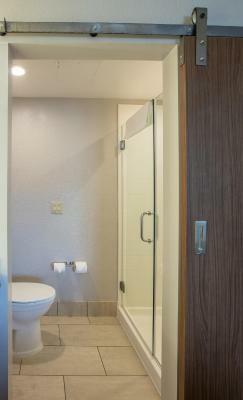 Bathroom privacy with sliding door. Parking was a bit exapensive. Floor was not clean in room. Found a pill and a hair ball that did not belong to us.